The Jane Addams Memorial Tollway in Illinois is a 79-mile (127 km) segment of Interstate 90 from Interstate 190 in far northwest Chicago to Illinois Route 75, one mile (1.6 km) south of the Wisconsin state line. For 16 miles (26 km), Interstate 90 is concurrent with Interstate 39 and U.S. Route 51. The highway is named after Jane Addams, Nobel Peace Prize winner and founder of the Settlement House movement in the United States. The tollway was built in the late 1950s and early 1960s from the O'Hare area (at the Tri-State Tollway) to the WI line north of Rockford. The route is signed as I-90 on its entire length. From the Rockford Curve to the last exit in IL (IL-75), US-51 and I-39 also run with the Tollway. This tollway is one of the few roads in the United States where the exit numbers increase traveling west. Mileage markers count up from Chicago-O'Hare International Airport going west. East of Interstate 190, Interstate 90 merges into the Kennedy Expressway. 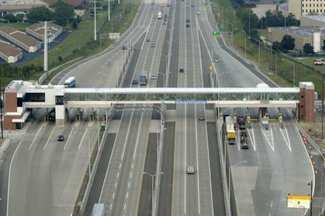 Prior to September 7, 2007, the tollway was known as the Northwest Tollway. The Northwest Tollway will soon be no more. The 79-mile stretch of I-90 between Chicago and Rockford shall instead be called the Jane Addams Memorial Tollway. The renaming, originally pushed by lawmakers earlier this year, was approved by tollway officials Friday. With that, one of the nation's most well-known, turn-of-the century women will now constantly be on the tip of tongues in the suburbs. "I'm thrilled," said state Rep. Patricia Bellock, a Downers Grove Republican who supported a resolution for the renaming in May. "This will bring awareness of a woman who was a pioneer." Jane Addams, a Rockford College graduate born in 1860, gained international recognition for her work helping immigrants adjust and survive in Chicago's slums through her Hull House. She also was an accomplished writer, a force behind the women's suffrage movement and a prominent advocate for world peace. Addams died in 1935 in Chicago. The Hull House still stands on Chicago's near-West side and the charity continues to work with under-served residents. Bellock said a 10-minute video played by the Hull House Association for the state's Conference of Women Legislators earlier this year sparked the idea to rename the Northwest Tollway in her honor. It is unclear when the new name will catch on, but tollway spokeswoman Joelle McGinnis said new signs using that name could be up by the end of the year. Once the renaming is complete, the Tri-State Tollway, I-294, will be one of the few expressways in the region not yet named after a president or prominent citizen.